Bailcast Ltd. was established by its Managing Director Philip Hayward in 1980. Our premises are in Chorley, Lancashire, North-West England. With 30 years' experience in design and manufacture of rubber vehicle components, Bailcast supplies distributors worldwide with universal stretchy CV joint boots and steering rack boots. Duragun®, Duraboot® and our Universal Product Range are covered by worldwide patents. A wide range of accessories will help customers in fitting our products. Continuous innovation and design skills have made us market leaders. Company-wide commitment to quality has enabled us to stay at the top. 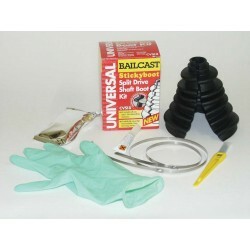 Bailcast guarantees quality, time saving, easier fitting and profit for customers large and small all over the world. Stickyboot Split Universal CV Boot. Flexible universal cut-to-size boot for shafts 19-35mm and CV joints 56-120mm.